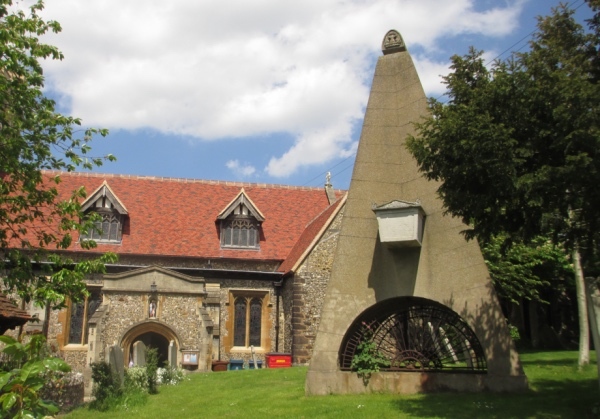 One of the more eccentric grave monuments in London, this massive triangular shaped memorial in a Pinner churchyard was erected by landscape gardener and horticultural writer John Claudius Loudon for his parents. 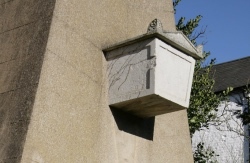 Located in the churchyard of St John the Baptist, the massive Grade II-listed monument is shaped like an inverted V with an arch piercing the base and features what appears to be a stone coffin stuck through it about halfway up the structure. On one end, it bears an inscription to Scottish merchant William Loudon, who died on 29th December, 1809, and, on the other end, another to his wife Agnes, who died on 14th October, 1841. It’s been suggested – and the words on the ornamental ironwork in the arch, ‘I Byde My Time’, are seen as supporting this theory – that the reason for the odd design lies in the terms of a will which stipulated Loudon and his wife would only inherit a sum of money if their bodies stayed above ground. That theory kind of falls apart, however, given that they are actually both buried below the monument. Another theory suggests the monument was deliberately designed to show that the couple were socially above – or perhaps closer to God – than the rest of those buried in the graveyard. John Claudius Loudon, who died in 1843 – just a couple of years after the monument was erected, is buried at Kensal Green.